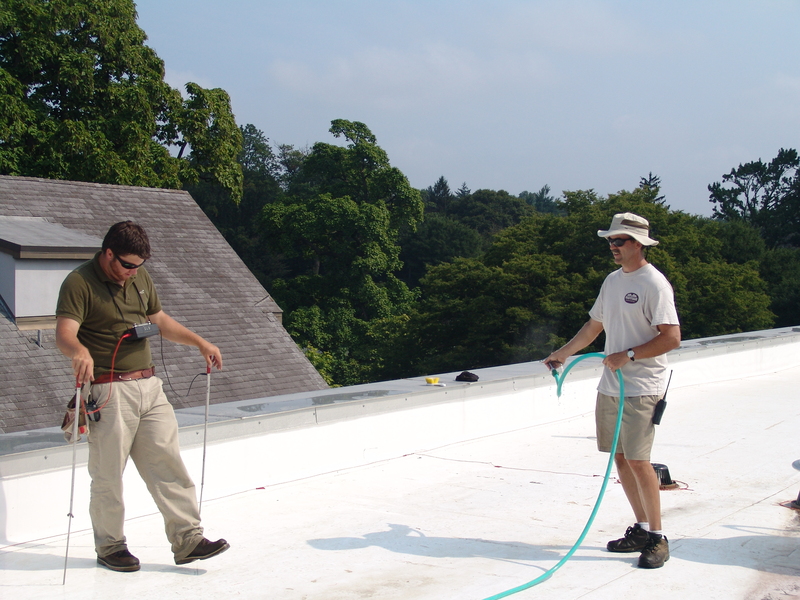 Today, we began the process of installing Swarthmore College and Scott Arboretum’s third green roof on the newly built Kemp Hall. This green roof will cover over 7000 sq. ft. and 5 different levels. With this roof, tour participants will be able to view a portion of the roof from a lobby instead of through a student dorm room as currently done with the Alice Paul Hall green roof. Another advantage for educational proposes of this green roof are participants will not have to climb an awkward ladder to gain access to the roof. A small door with a simple step will be the only obstacle to entering the roof on a tour. 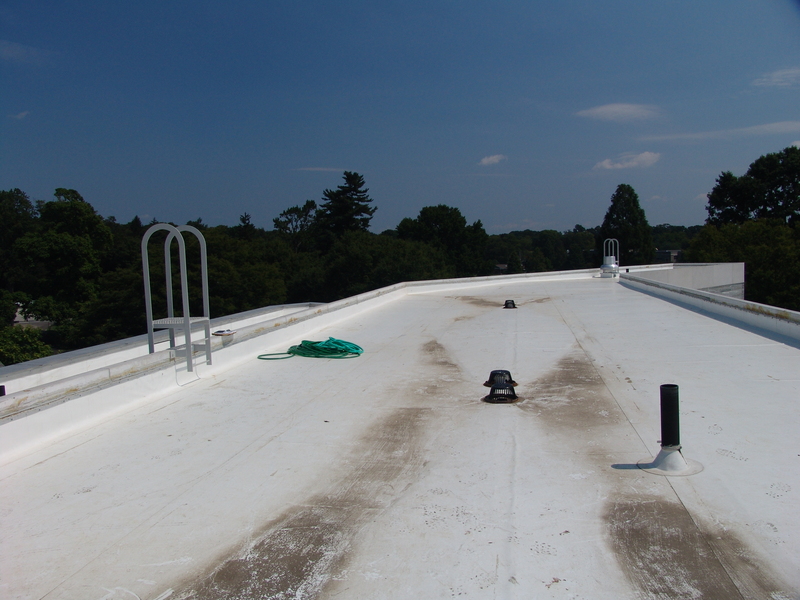 Before any materials can be placed on the roof for installation, the area must be tested for leaks. Today, Adam Black of International Leak Detection used Electric Field Vector Mapping (EFVM) to ensure the roof has a proper seal. EFVM test is a low-voltage method that creates an electrical potential difference between a non-conductive membrane surface and conductive structural deck or substrate, which is earthed or grounded. As you can see from theses images, Adam is creating (as he called it) a force field around the metal objects on the roof because they will give him a false reading unless protected. 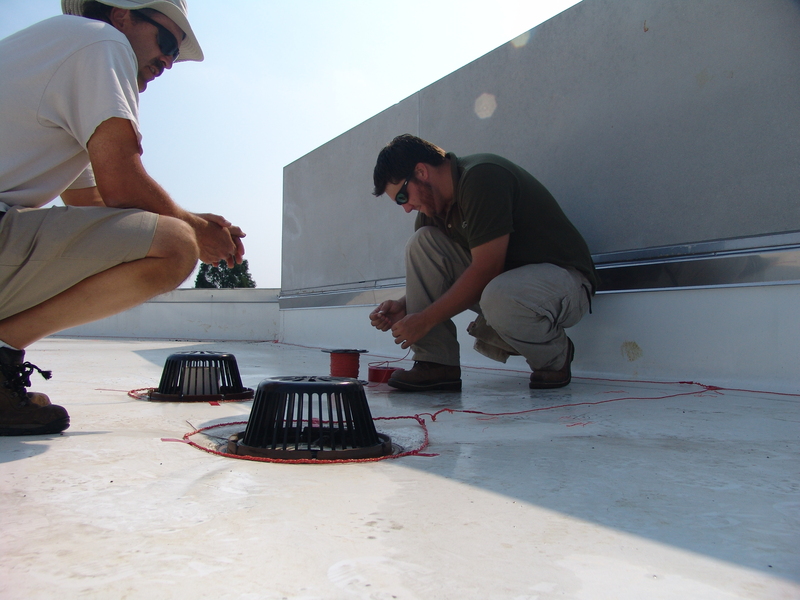 Once the roof is prepared for the test, an electric field is created by applying water on the membrane surface. 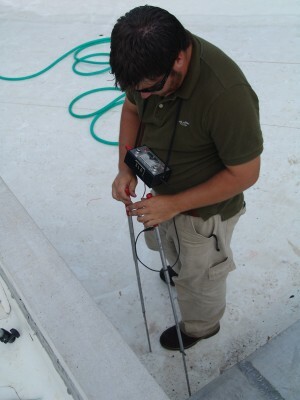 As Swarthmore College employee, Lars Rasmussen applies a thin coating of water, Adam uses it as a conductive medium. 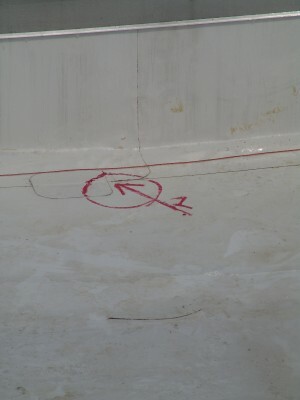 A breach in the waterproof roof membrane creates a vector (ground fault connection), which can be measured by Adam. 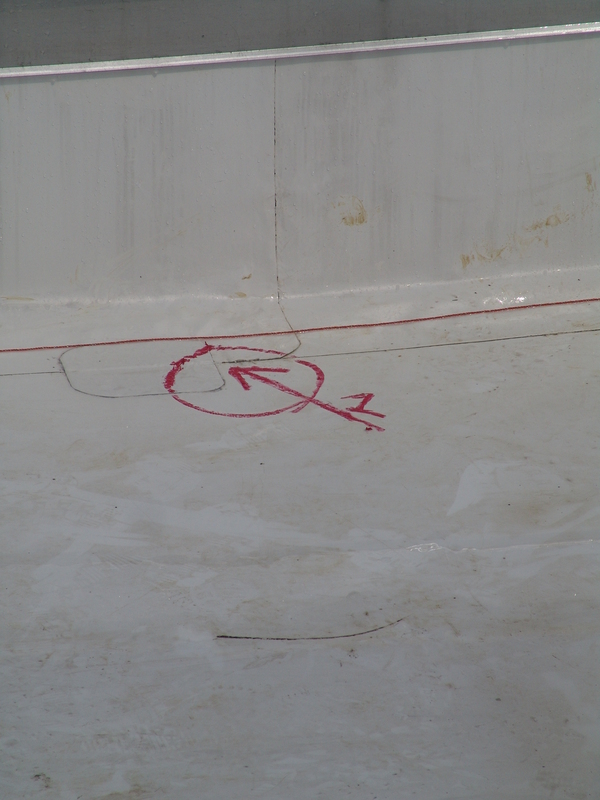 Once a leak is found, it is marked and must be repaired before installation of the green roof begins. The green roof is scheduled to be installed August 18-21, with planting taking place in late September. Adam commented the number of leaks he has detected varies from zero to 320. How come he doesnt isolate the breaches he locates? Doesnt it still show up when testing areas around it? I saw this beautiful green roof and I want to install it. But I need more information about it. ? Dear Rochell, Here are some additional resource about green roofs.